This is a process whereby we take a 360° degree look at your goals and dreams. We address short term temporary needs while always keeping the long term big picture in mind. In this world of competitive price driven options and choices, it is easy to get off course and forget about value. We can get caught up with easy and cheap solutions only to find down the road that they do not equate to value, nor will they support us when we are counting on them the most. As a Financial Navigator, my approach is based on a 5 step proven process. I help pilot my clients on a journey through life to reveal benefits that will not only impact today, but have a profound impact on future generations. Imagine that all the exotic islands and destinations in the world represent your goals, dreams and aspirations. How will you get there? Let me help you chart and navigate the safest and most efficient passage while keeping in mind there may be storms on any voyage. 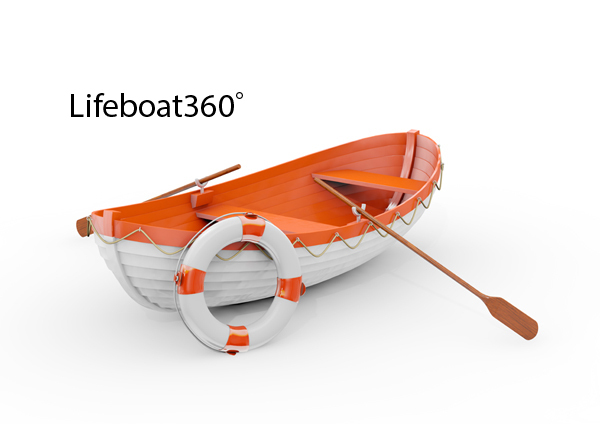 Lifeboat360°is about being prepared. With your desired destinations on the horizon and a safe course charted, we will prepare for the financial voyage. We will decide on the best type of financial vessel and financial safety equipment you will need. We’ll also review what you already own to see if it fits the journey and if we can build around it. If not, we’ll modify or adjust your assets, making sure everything is just right. With safety equipment, it is imperative that it works properly when you need it most. As life changes, so do our destinations. That’s why we’ll adjust your sails to stay on course, one degree at a time. We may also need to update your vessel and change some of the equipment along the way. As you navigate through these times, I will be there for you, making sure your plan is always focused on the big picture. …And when you finally reach the end of your voyage and drop anchor in a safe harbour, I will help ensure that your vessel will be ready for the next generation. Discover an individually crafted and customized 5 step Process designed specifically to meet your personal goals and dreams… because no two plans are the same. Planning for your financial security is about more than just your retirement; it’s about building a financial strategy that considers your current needs, long-term goals, retirement income phase and lastly estate and legacy planning. All this while taking into consideration health risk protection and minimizing taxation issues. Listen as you describe what financial security means to you, now and for the future. Understand fully the most important aspects to you and your family while working with you to meet your main priorities. I will help you identify both personal and financial goals and objectives. These may include support for elderly parents, children’s education, relieving financial pressures, retirement or estate planning. Complete a 360° Degree Analysis of your current situation utilizing specialized forecasting software. 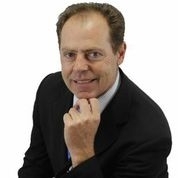 I will take into consideration cash flow, expenses and all your current risk management solutions, saving and investment strategies, as well as any pension plans and government plans (CPP and OAS). Study and Cross Reference to expose potential turbulent dangers and shortfalls that pose a risk to your goal of achieving financial independence. Problem areas could include: little, too much, or the wrong insurance, high tax burdens, investment risks, cash flow challenges, outliving resources and estate issues. These areas must be identified before solutions can be considered. Develop Strategies and Craft Solutions to help you implement a customized personal strategy that considers your short and long-term goals, keeping a solid balance between cost efficiency, cash flow, value and goals. Implementing the right strategies now is essential to helping you reach your desired goals and objectives. Provide Ongoing Navigation through personalized service to ensure you are still on course and, if not, make adjustments to provide the best results to meet your changing needs over time, always reflecting the current economic conditions. My approach to Wealth Accumulation and Estate Preservation is to chart a plan that will maximize your income level during your primary retirement years. The first and most important step is to determine your goals and objectives and then prioritize them. Next, we will look at the four distinct elements of the life ring of planning and establish a strategy to follow in each area. Once the strategies are put in place, they will be reviewed regularly as your life changes. Risk management –First, to ensure that adequate assets are available to cover unforeseen expenses such as those related to an illness, an injury or a long term care expense, so that personal retirement savings and assets are not depleted. Second, in the case of an untimely death, to make sure loved ones are properly looked after. 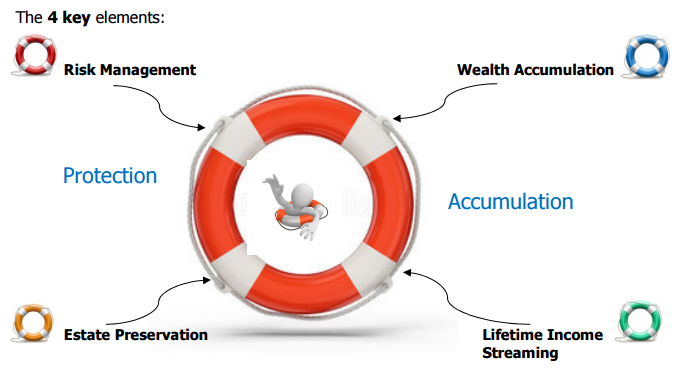 Wealth Accumulation - to develop a personally tailored investment portfolio that takes into consideration your lifestyle goals, retirement objectives and risk tolerances. Lifetime Income Streaming - to develop an income stream level to match lifestyle needs, while keeping pace with inflation and enduring the entire life voyage. Draw funds from all sources with the most tax and cash flow efficiency. By utilizing my comprehensive Lifeboat360° process, you will eliminate financial stress. You will have peace of mind knowing that the plan you have put into place encompasses all aspects that are important to you…your desired lifestyle at retirement, provisions for health and illness risk, estate preservation and transfer of wealth to family, beneficiaries and charitable causes. Why not live stress-free?